Silver Dangle Earrings with Rose Quartz and Garnet Stones, "Romantic Journey"
Sweetly pink and luminous rose quartz takes you on a romantic journey that ends with crimson garnets. The road takes the scenic route in the form of a silver spiral, but you arrive looking dandy. 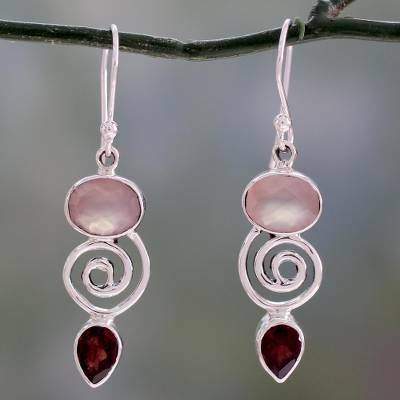 Neeru Goel in India crafts the dangle earrings with natural gems set in polished sterling silver. The checkerboard-cut oval rose quartz and the pear-shaped garnets total over 7 carats. You can find garnet and rose quartz dangle earrings 'Romantic Journey' by Neeru Goel in jewelry categories such as Birthstone Earrings, Garnet Earrings, Rose Quartz Earrings, Silver Earrings, Sterling Silver Earrings and Dangle Earrings. Enjoy exploring these sections for other Novica treasures. These earrings are uniquely designed. They are of a very nice size, not too small or too large. The silver is of a good weight. The garnet is a deep lovely color. I only wish the stones were secured better than with glue. I worry that the stones could be dislodged. I love these earrings, and the matching necklace. They are stylish, well made, and beautiful to look at. All my friends compliment my jewelry since I started purchasing at Novica. Beautiful workmanship. Well crafted and a lovely design. It has a matching necklace in the same motif. Very different. Perfect! Exactly as pictured. Love them!